The hazy New England style IPA’s have been the big trend in the craft beer world for a while now. With very little hop bitterness at the end and a more tropical and juicy sweetness, this style has been embraced by beer lovers and breweries alike here in Louisiana. With great selections of this style from Parish Brewery (Ghost In the Machine), Great Raft Brewing (Grace & Grit) and Gnarly Barley (Jucifer) there’s no shortage of really delicious cloudy brews for us to enjoy. Now Tin Roof Brewery has joined the craze with their latest taproom only release, the FOMO Double IPA. After redesigning the recipes for their flagship Voodoo Pale Ale and Juke Joint IPA, new Head Brewmaster Michael Till along with owners Charles Caldwell and William McGehee decided the time was right to start working on their own signature double IPA. After a few months of doing test batches and honing in on the right recipe, the FOMO, which stands for Fear Of Missing Out, was born. The beer has a deep golden color with the haziness to match its depth. The immediate aromas I picked up were some dark fruitiness and tropical notes with a hint of the dankness that comes with the Eureka hops. The body is very light and easy drinking for 8% ABV beer. The taste is filled with hints of pineapple and candied fruit along with some piney dankness which is normally associated with some of the juicier west coast style IPA’s. There was some slight bitterness on the end with a nice dry finish. Overall I think Tin Roof has done a nice job with their first entry into the haze filled market of New England style IPA’s. This brew is a taproom only release (hopefully that changes) so make your way over to Tin Roof and grab a glass and/or get yourself a crowler to go. There has been a lot of buzz surrounding the opening of BRQ Seafood and Barbeque. While BBQ is not a new concept to the South, having new local BBQ place is filling a gap in what is a pretty sparse culinary category in Baton Rouge. BRQ’s Chef Justin Ferguson is a Baton Rouge native who recently returned home after overseeing a number of Chicago restaurants and brought his knowledge and experience back to South Louisiana to show off his pit master skills. The restaurant is large and inviting and has a contemporary, yet rustic feel. We were greeted by sunlight pouring into the large, street facing windows and delicate flowers adorning every table. Despite its size, it still feels quaint-- homey almost. Once we were seated, our server came to greet us with a basket of house made BBQ chips and pickles. Honestly, that could have been my meal. It took everything in my power to control myself from gorging all of them down because our waiter informed us that we had a feast heading our way. Even Jay, a known pickle hater, downed a handful of pickles and even seemed to like them. That’s big news people! After I mentally prepared for the feast ahead, the dance of BBQ began. The opening act was an array of appetizers. One by one we were served crab beignets, boudin balls and a heaping mound of buffalo mozzarella in olive oil topped with caviar. I was not expecting to see a mozzarella appetizer at a BBQ restaurant, but I'm not complaining. It was by far my favorite appetizer and a nice change of pace from the typical fried fare. 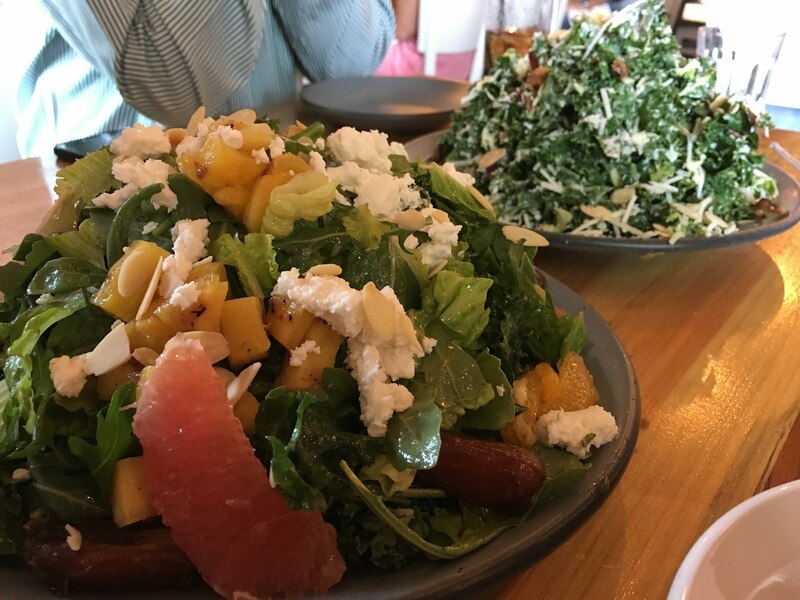 Act two was on the lighter side, a pair of salads. Maybe “light” is the wrong word because it was more like a mountain range of salad. The Brussels sprouts and kale salad came topped with smoked bacon, parmesan, toasted almonds and a tahini dressing. It was a really nice compliment to the BBQ menu and would be delicious topped with pulled chicken or pork if you’re looking for something “lighter” on the menu. The Moroccan Citrus Salad is a perfect summer salad. Mixed greens topped with grilled pineapple, carrot, pink grapefruit, orange segments, dates, almonds, goat cheese and a citrus mint vinaigrette is a meal in itself and almost too pretty to eat! Next came the headliner. A procession of waiters presented us with the “Feed Me" platter. I think just about everyone in the restaurant had to come over and get a look at the butcher block of deliciousness that came to our table. The board was packed with St. Louis which have a straight, rectangular cut and tend to be more tender and Baby Back ribs which have a meaty cut with short, curved bones, smoked and pulled chicken, pulled pork and sliced brisket. The meats were served with four kinds of sauce: original mild, North Carolina vinegar, Louisiana spicy, and South Carolina mustard. Accompanying the board were sides of green beans, collard greens cooked down with bacon, mashed potatoes and goat cheese jalepeño grits. We were all impressed by the display and all of the meat was smoked and cooked to perfection. The sliced brisket was to die for and the pulled pork was the perfect, juicy base for the various sauces. Phew! Yall, I am getting hungry again writing this. 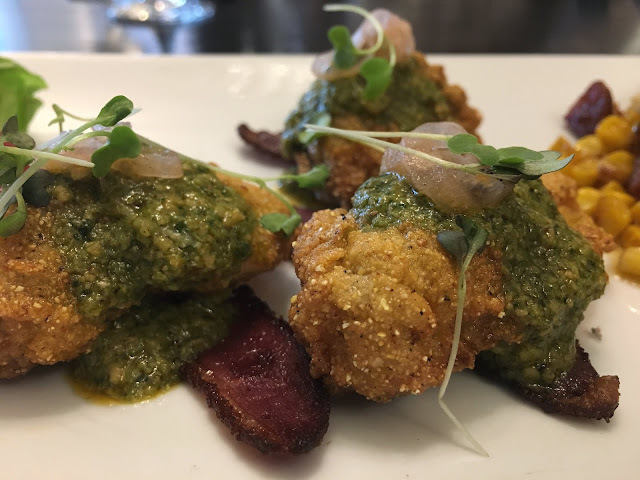 BRQ put on quite the show for us and we had a wonderful experience dining at what we are sure is a new staple in the Baton Rouge area. Word to the wise: come hungry. 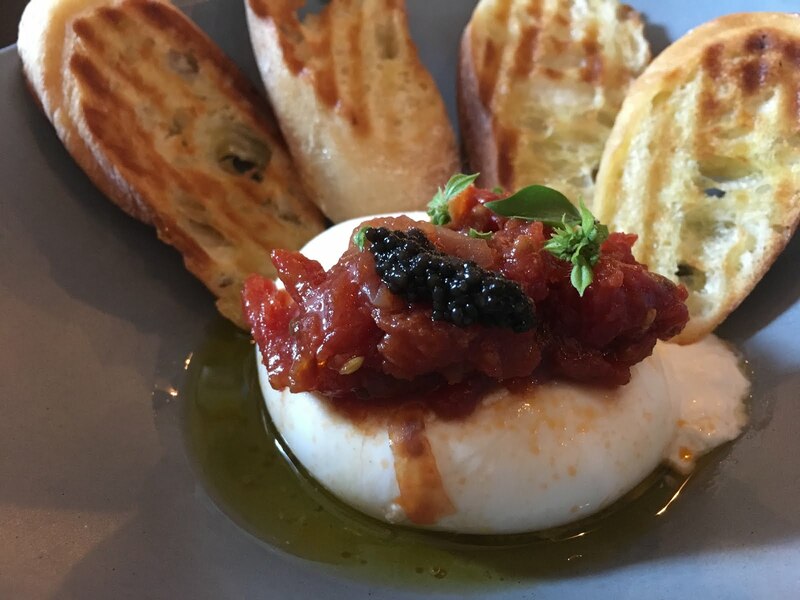 I must say, until recently I had not heard much about Tallulah Crafted Food and Wine Bar, or even knew where it was located. To be honest, I had never stepped inside of the Renaissance Baton Rouge until visiting Tallulah last month. It’s beautiful in there! I typically refer friends and family who are coming to visit to stay downtown, but on the corner of Bluebonnet and Anselmo is a hotel with a stunning interior and a surprisingly good wine bar and restaurant. I went to meet a friend at the wine bar for a glass of wine before sitting down for the dinner tasting and y'all, I thought I walked into heaven. There was bottle after bottle of wine on tap. Tallulah uses an Enomatic Wine Serving System, which in layman's terms means a fancy way for preserving open bottles of wine which allows them to serve lots of different wines by the glass. To top all of this off I was pleasantly surprised to find out it is half off glasses of wine on Wednesdays AND there was live music. We were off to a good start. After gabbing, having more wine than we planned, and catching up about life and love and our growing waist lines we finally sat down for dinner. The restaurant is small and intimate, located directly behind the bar. You could still hear the live music playing in the bar area and we had a lovely view of the outside patio thats full of patio seating around fire pits (note to self: drink wine on tap next to a fire this winter). Once settled we were presented with a collection of appetizers. 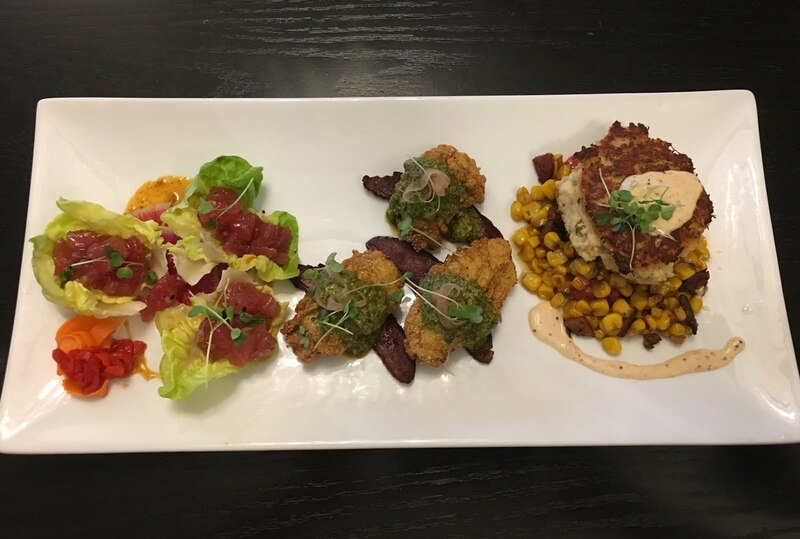 Tuna poke delicately presented in lettuce cups, fried oysters over duck bacon and crab cakes served on a heaping pile of corn maque choux. I could not pick a favorite from these because they are all so different but the fried oyster over duck bacon stood out the most. The oysters were delicately battered and the duck bacon was not chewy or dry. I could have popped one after another of those suckers and not felt the least bit guilty. Next, we were brought a sandwich duo. A three cheese grilled cheese filled with bacon and red onion jam and a duck BLT. 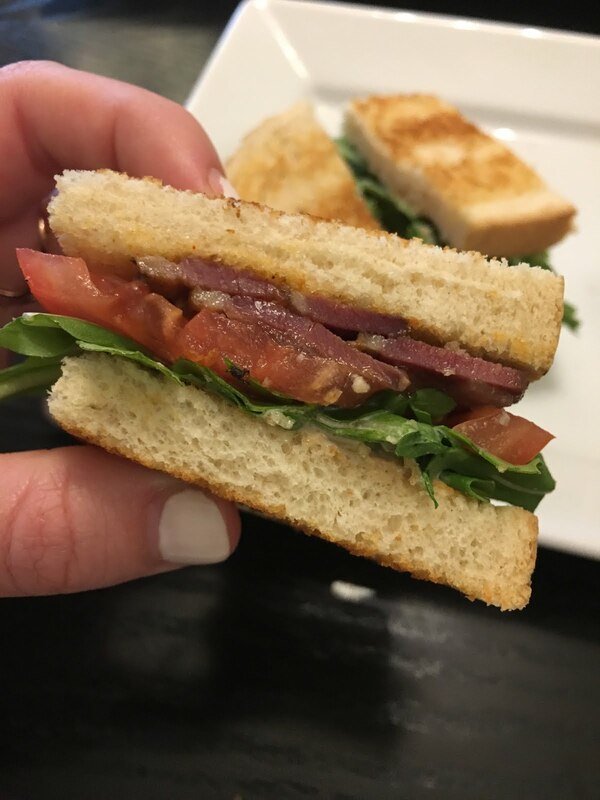 Duck bacon in a BLT. Hallelujah! Duck was a common theme throughout the dinner tasting and I was pleased to learn from Jace Schexnaydre, Tallulah’s Sous Chef, that his staff takes a lot of pride in not wasting any parts of the ingredients that come through their kitchen. If they have duck on the menu, they are going to do their damndest to use all parts of the duck in other dishes, nothing goes to waste. Up next was a trio of entrees. Cold smoked fried chicken served alongside a four cheese cast iron mac and cheese, a steaming bowl of bouillabaisse, and a vegetarian eggplant dish with shiitake mushrooms stacked high over quinoa. Let me interrupt here for a quick story: When I first moved to Baton Rouge from Las Vegas, Nevada, needless to say, I had never experienced true cajun cooking. My grandfather who has lived his whole life in Findlay, Ohio had taken a trip to New Orleans many, many years ago and apparently had one of the best dishes of his life, a bouillabaisse. Every time I talk to my grandfather, he asks me if I have had a bouillabaisse yet. And for eight years I have had the same answer, “I can’t find it anywhere”. Well, I finally got to try a bouillabaisse and maybe I am being sentimental here, but I was so impressed by this rich, flavorful dish. 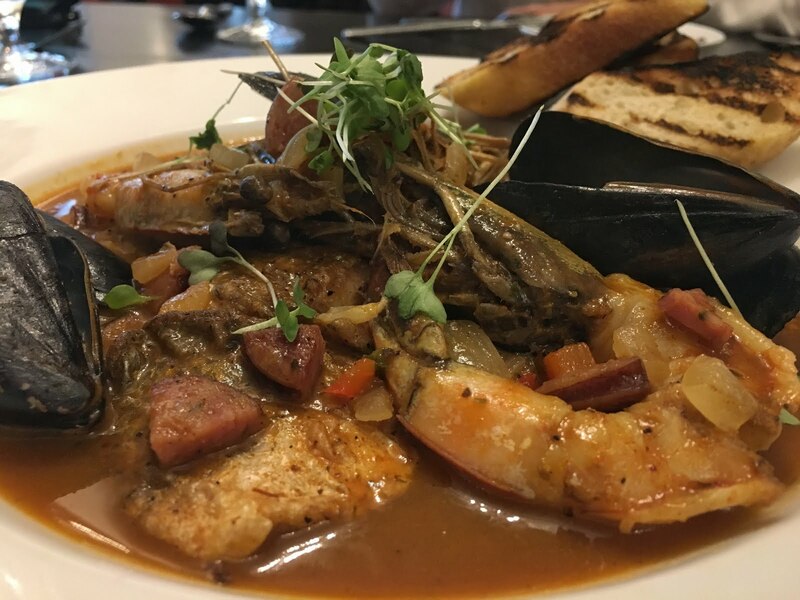 The head on shrimp, chunks of delicate redfish and mussels all soaking in the creole broth mixed with the hunks of andouille made for a truly spectacular dish. I could not wait to call my grandfather the next day and rave to him about my bouillabaisse experience. So, thank you Tallulah, for ending my eight year quest! 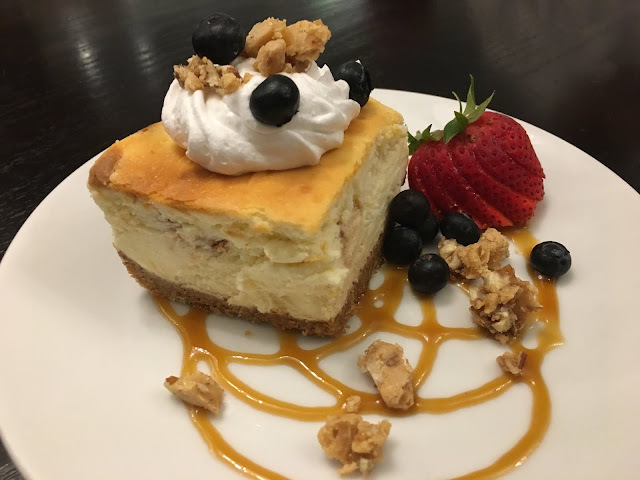 Last, but certainly not least a single, hearty slice of cheesecake topped with chunks of praline, a honey drizzle and sprinkled with blueberries finished off the night. Just when I thought I could not take one more bite...but who can resist cheesecake? I left that evening with a parting bag of duck cracklins in hand and incredibly impressed by this tucked away gem on Bluebonnet that I had never visited. Believe me, if there is a restaurant in town serving half off glasses of wine and rich bowls of bouillabaisse, you will see me there again. Good morning everyone, and a Happy Birthday edition of #wakeywhiskey to Mr. 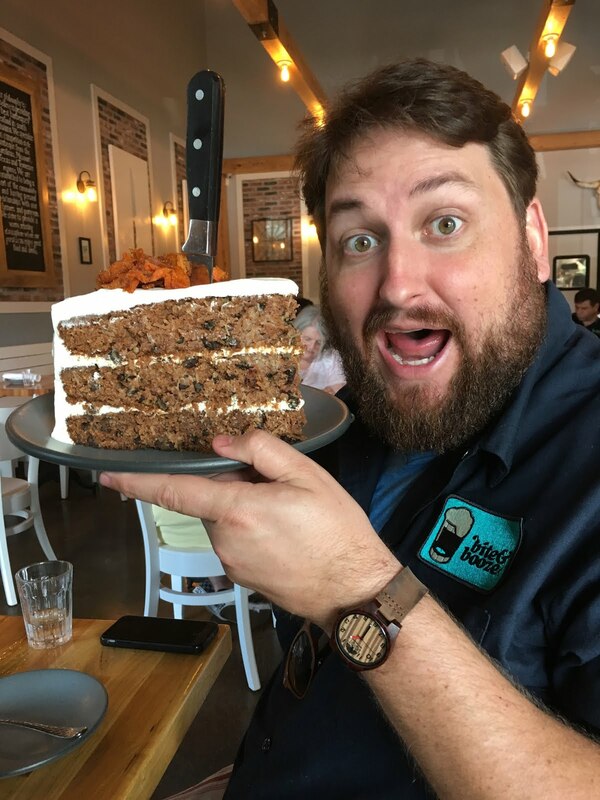 Bite and Booze himself, Jay D. Ducote! My little bro is turning 36 today, so in his honor I'm treating myself to a #wakeywhiskey. 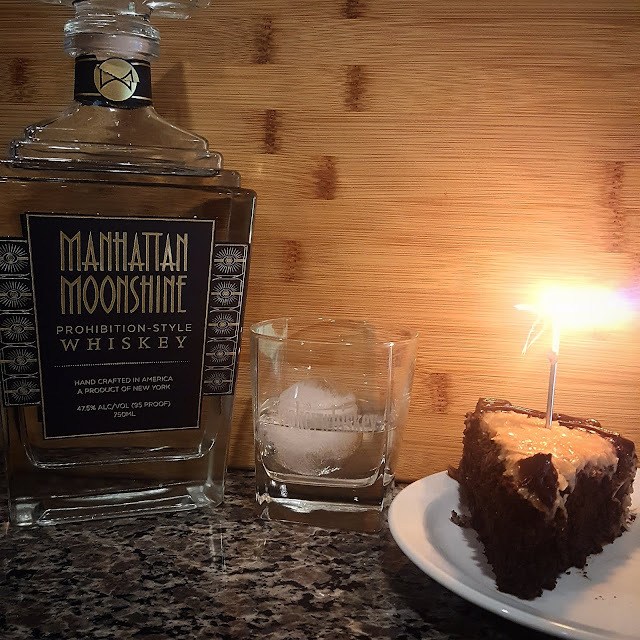 My selection today is a Manhattan Moonshine Prohibition-Style Whiskey from the Manhattan Moonshine Company out of Westfield, New York. Now, Westfield isn't exactly in Manhattan, in fact it's about as far as possible from New York City as you can get without leaving the state... way over in the Western tip on Lake Eerie about 10 miles from the Pennsylvania border. Regardless, moonshine was made throughout the country during prohibition, and whiskey is made throughout the country these days. Manhattan Moonshine is made from 4 grains, featuring oats but not including corn. It is then distilled in their handmade still prior to being barrel aged for less than an hour and then immediately bottled. It clocks in at 95 proof or 47.5% alcohol, nowhere near the strength of true "white lightning" but also a step up from the standard 80 proof of the majority of liquors. On to the whiskey itself... obviously the color is clear, just like water, vodka, and other unaged spirits. Less than an hour in the barrel does not do much, that's for sure! The nose is very clean, hints of grain but nothing overpowering, including the booziness. It's a little sweet, and if anything slightly on the grassy side. I really enjoy the taste as well, super smooth with hints of sweet grains. There is a little hint of booziness at the end, but nothing I'd normally expect from a 95 proof white whiskey. The heavy oat presence in the grain bill gives this one a crazy easy mouthfeel that drinks way easier than it should. Their website gives plenty of cocktail recipe ideas, but personally I enjoy this one just fine straight. Historically, I've had a tough time with white whiskeys, but between this one and the Ironroot Republic moonshine featured on the 4th of July, I'm starting to come around. So, Happy Birthday Jay! And be sure to enjoy a #wakeywhiskey this morning! The Poboy (Po’boy, Poorboy…? ), where do I even begin? It is as important to Louisiana as festivals, Bourbon Street or hurricanes. It occupies an entire row on the metaphorical Cajun Food Pyramid. It is a bonafide staple of so many people’s diets, and I am no exception. From their humble beginnings as street food for New Orleans transit strikers in the early twentieth century, poboys have evolved into a sort of cultural (and epicurean) phenomenon. No matter where you are in Southern Louisiana, you are sure to be able to get your hands on one of these quality sandwiches. And it is with great enthusiasm that I encourage you to eat at every poboy stop that your stomach will allow. There are plenty of options. Oh, and trust me, no matter how many you have, they don’t get old. It was on this very crusade that I happened to stumble into a small restaurant on the corner of Jefferson Street in Downtown Lafayette last summer. I agreed to meet friends at a new restaurant called Pop’s Poboys. We were set to journey on a two week camping trip the following day, and we were all in search of a parting meal, Louisiana style. When I first walked in, I could sense the trendiness. This place was like a plaid wearing, man-bunned hipster playing Ice Cream Paint Job on acoustic (excuse the hyperbole). It had it all: chalkboard menus, a self-service water station, and butcher’s paper on the tables! This wasn’t the greasy, grimy, country music type of poboy place that I was used to. This was poboys for millennials. Who was this “Pop,” guy anyway? Even more questions popped into my head as I looked at the menu hanging from the wall above me. What was this place? I saw the classics, such as catfish, roast beef, and hot sausage, but what were these imposters? Meatball poboy, Nashville hot chicken poboy, red bean falafel poboy, where does it end?! I grew skeptical, but my friends at the table encouraged me to try something new. It was then that I first laid my eyes on the beast of a sandwich known as the Cajun Castro. Pulled pork, ham, cheese, stewed greens, AND fried pickles all on crispy french poboy bread. This wasn’t a cuban, but it wasn’t a poboy either. My curiosity overcame my doubts, and I went for the Castro along with a side of fried okra (you know, to keep things authentic). When it arrived at my table, I started to grow excited. I suppose that my stomach was overpowering my mind, because the juices seeping through that butcher paper containing the sandwich were having me feel some type of way. I peeled back the tape, unwrapped the thing like it was Christmas morning, and took a moment to behold what was in front of me. Forget about whether it was authentic or not, this thing looked GOOD. The crispy loaf gave way to creamy smothered greens that were seemingly struggling to bear the weight of all the meat on top of it. Cheese and fried pickles were on top of that, along with the top piece of the french bread that seemed like it had fully coped with the fact that it was never going to see its bottom half again. This thing was packed, and I dug in. The cajun pork tasted like it had been cooking for hours, and its fattiness was cut perfectly by the bold greens underneath. And despite the overwhelming juiciness, the bread and fried pickles managed to stay crispy enough to provide varied texture. There is a lot to be said for good bread on a poboy. I truly don’t know how, but I finished the thing. The flavors were too good to go to waste. Somehow, amidst all the internal conflict, I knew that I’d have to come back. Poboy or not, this place was too good to pass up. I could keep a secret from my Cajun forefathers, right? Two weeks passed and I arrived back from my camping trip. It took less than twenty-four hours at home before I found myself looking through Pop’s glass doors once more. This time I was serving as the millennial ambassador to my parents as I led them through this New-Age poboy experience. This time around, I opted for the Hot Hot Chicken Poboy. One of the employees warned me that this Nashville style sandwich would bring the heat, but I was not afraid. Although I am usually skeptical of a restaurant’s judge of spice, this sandwich didn’t hold back. The homemade buttermilk ranch and house pickles cut the spice to the point where I can only describe the sensation in my mouth as, “hurts so good.” My parents were completely on board too after their experience. A Shrimp Bahn Mi Poboy is untraditional, but man, did my mom enjoy it! My dad had similar sentiments after chowing-down on the Cajun Castro, the one that started it all for me. After I realized that my parent’s, true poboy enthusiasts, had an incredible experience eating these non-traditional dishes, I started to wonder: does the tradition even matter? Pop’s has since become the go-to spot for my friends and I anytime that we find ourselves in Lafayette. The uniqueness is too intriguing to pass up on. From the hamburger poboy with pimento cheese to the cheese fries with spaghetti noodles and pickled onions, I haven’t been led astray. Even their more adventurous weekly specials are a guaranteed home run. In fact, my absolute favorite sandwich from Pop’s is the El Guapo Cochon. Try not to salivate: crispy poboy bread with deep red, pastor style pork, pineapple pico di gallo, a sprinkling of queso fresco, and a little bit of spicy chipotle mayonnaise. The El Guapo has got the perfect amount of spice, and the pineapple is just bright enough to register on the tastebuds. The queso fresco is a subtle yet crucial sprinkling of cheesy beauty on top. I could eat it every day, but unfortunately it's available only on a rotating weekly basis. With that being said, be sure to check out Pop’s Facebook, they keep it populated with all of their latest creations. I’ve been an almost shameful amount of times to this place over the past year, and in that time I have achieved a bit of an ideological transformation. I used to believe that Louisiana’s cajun and creole culture is rooted in its ways, unchanging, settled. I thought that a poboy had only a handful of of variations that had been tried and tested over the course of generations. I couldn’t imagine the New Orleans street car workers enjoying a Nashville Hot Chicken version of their beloved sandwich, but this isn’t the late 1800’s. Pop’s has helped me realize that an area’s culture is living, no matter the number of references made to its past. No agent of culinary change would exist without there being an element of disruption, and Pop’s is that nontraditional force. The cajun cookbook is long and venerated, with the poboy claiming one of the largest chapters. But that cookbook is still being written, and I can promise you that Pop’s Poboys in Lafayette, Louisiana will be adding a few pages. South American Supper: A Private Dinner at Red Stick Spice Co.
Gov't Tacos Chef Aimee Tortorich, Jay Ducote and their culinary team were able to take a break from slinging tacos and focus on the latest Red Stick Spice Company private dinner, South American Supper for 24 lucky guests. The four course meal featured traditional South American foods, with a Bite and Booze twist. The guests starting arriving around 7, with the tantalizing scent of roasted potatoes filling up the store. 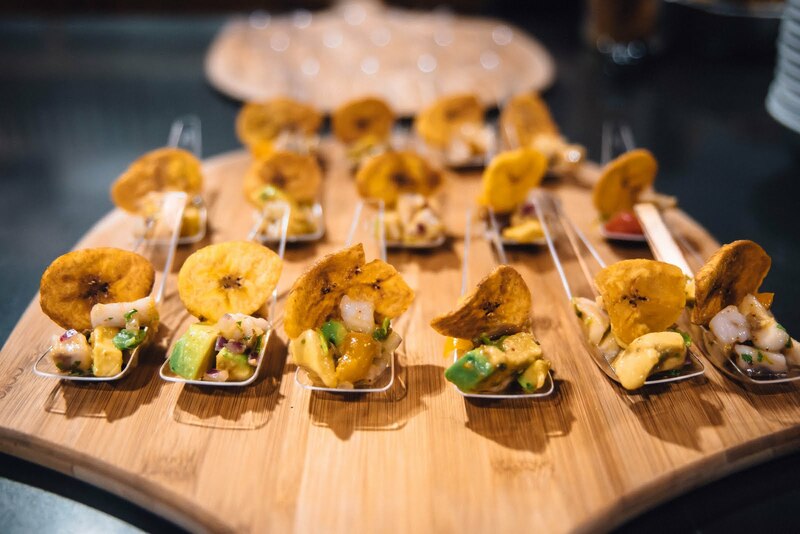 Our first passed course was red snapper ceviche with a crispy fried plantain chip and glasses of bubbly Prosecco. 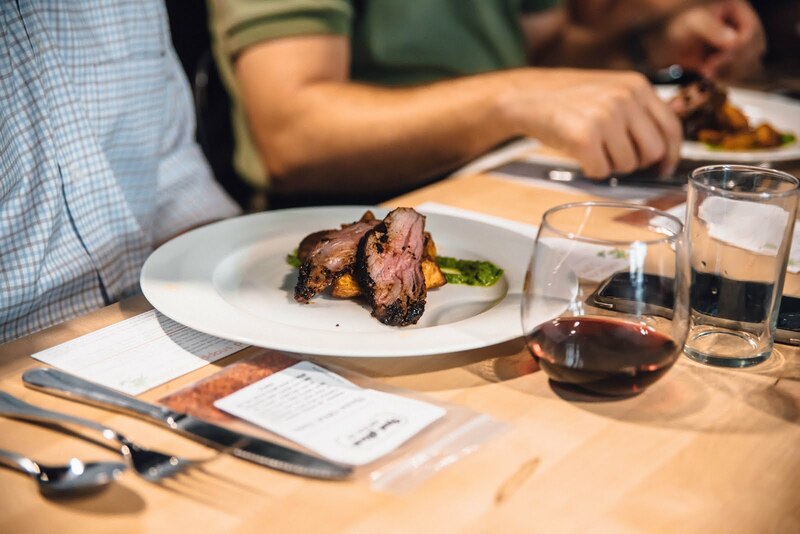 The guests enjoyed this course while perusing the store, allowing them to see all of the delicious oils, vinegars, and spice mixtures Red Stick Spice Co. has to offer. Once the guests were seated it was time for the second course, a seafood paella. Our paella was traditional, using Supreme Rice with saffron, mussels, shrimp, and green peas. The dish was complimented nicely by Jay D’s Blanc du Bois. An added bonus for the guests were the extra prepared mussels that were served family style to each table. The third course was a real show stopper: Cafeciteaux coffee rubbed tri-tip served over fresh green cilantro chimichurri with a side of creamy paprika roasted potatoes a la plancha. This course was probably the biggest hit of the night. Every plate brought back to the kitchen was licked clean. Our guests enjoyed this course with a glass of robust Malbec. 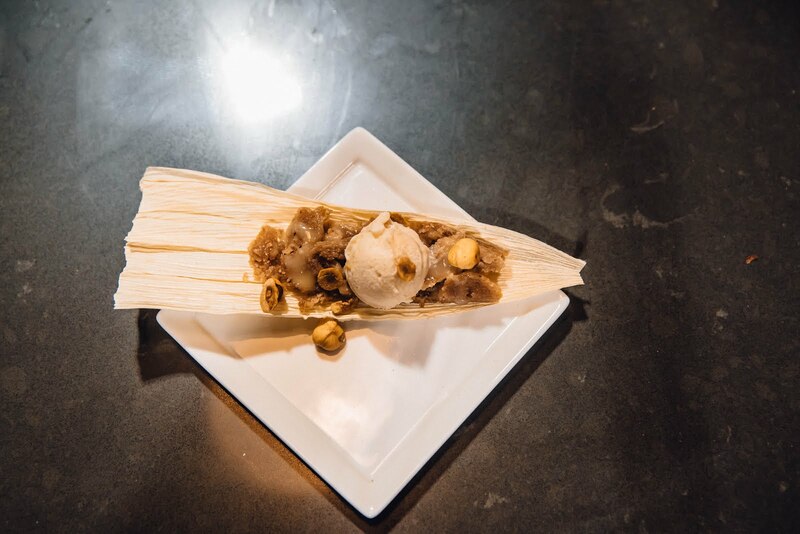 For the dessert course, the culinary team put a spin on traditional tamales, making a dulce de leche tamale served with homemade bananas foster ice cream. The tamales had a subtle sweetness and the bananas foster ice cream melted beautifully over the warm masa. The guests loved this unexpected dessert. Served alongside the tamale was Jay D’s Single Origin Coffee, with a splash of Frangelico hazelnut liqueur and cinnamon whipped cream. The dinner went off seamlessly, thanks to help from Anne and the Red Stick Spice staff there to help us out. 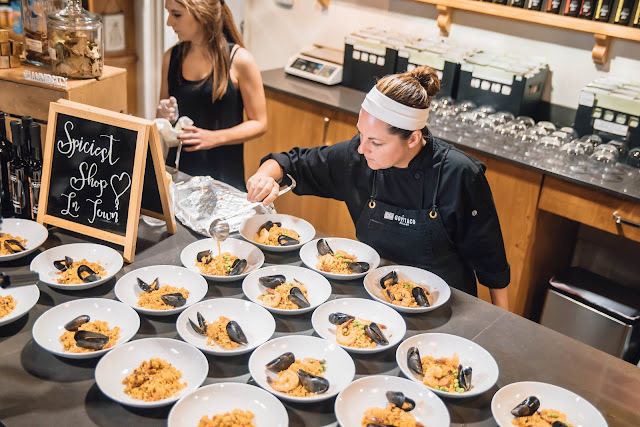 After the dinner was over, the team received such great feedback that we were inspired to plan another SOLD OUT Red Stick Dinner, North African Appetite on August 16! Since establishing Pico’s in 1984, it has become a shining beacon of “Mex-Mex” cuisine in the holy land of Tex-Mex. The Richards family treats their customers like relatives. When you enter the sprawling restaurant you can hear fresh margaritas shaking, smell the hand-pressed tortillas on the flat top and see the genuine smile across the faces of their employees. You can’t have a bad time at Pico’s; they simply won’t allow it. It’s a large restaurant, but don’t let that fool you. Chef, and owner, Arnaldo Richard has his hand in every dish. The attention to detail that goes in to the flavor built on each plate is extremely authentic. If you’re looking for true Mexican cuisine in the Houston area, you need not look any further. The depth of flavor isn’t just in the food though. Arnaldo’s daughter Monica Richards is at the helm of their fantastic tequila program. Even the most baseline of margaritas at Pico’s is top-notch. Whether you’re looking to demolish a couple of shakers of their house margaritas or taste from some of Monica’s select barrels, she has taken the time to curate a truly special tequila experience for their guests. The tequila selection alone is a worth the trip. Ontiones Carlos Slim is one dish that I think speaks to the attention to detail and flavor building Arnaldo's cooking is centered around. With this take on Oysters Rockefeller, Arnaldo uses an intricate blend of celery leaf, tarragon, chervil, parsley, herb saint, spinach, collard greens and purslane and tops each bite with cotija and parmesan cheeses. These mussels are sautéed in a white wine and crema sauce with Spanish chorizo and topped with micro cilantro. After we got a hold of their bolilla (similar to French bread) these babies didn't last long. The creaminess of the sauce combined with the flavor of the mussels and the little kick and umami from the chorizo made each one more poppable than the last. I'm not going to lie. I think about this next dish all the time. In a section on their menu called Al Ajillo you can find some of the tastiest dishes in the whole joint. Ajillo is a condiment in Mexican cuisine that is made by infusing olive oil with dried chilis and fresh sliced garlic for a minimum of 72 hours. It's even more amazing than it sounds. They sauté different types of seafood in this delectable concoction, but my favorite version is the octopus. So tender, it feels like you're biting into a cloud that's soaked in garlic/chile olive oil; insane. Mole holds a very special place in my heart. There's a lot that goes into each mole, but you can always be sure of one thing when it comes to this comforting dish: whoever took the time to make it, undoubtedly stirred in a lot of love. In this case Arnaldo moved me to feelings. The duck fell apart in the rich, decadent mole and the tostones hit the hearty, but sweet notes. I would order this dish again and again. Until next time, Pico's! If you're ever in the Houston area, Pico's is a must. Keep a look out for some of their phenomenal tequila dinners as well! 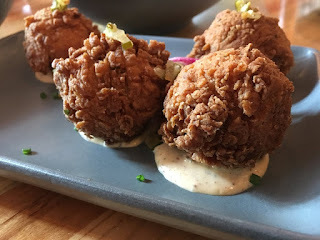 Before the new Copeland’s concept opened, the Bite and Booze team had the chance to try out Batch 13 Biscuits & Bowls. If you haven't been by to try the fun and inviting bright yellow restaurant, you're missing out. 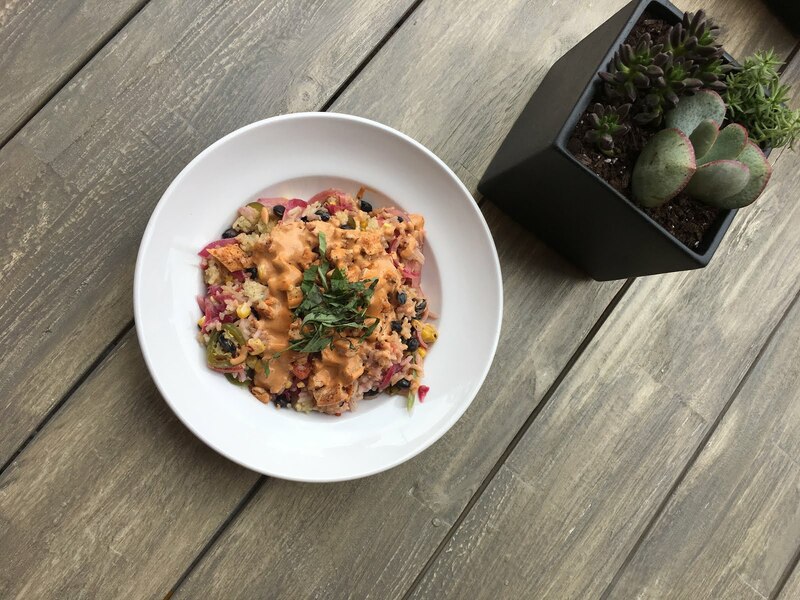 The menu is certainly different than the other restaurants under the Copeland's name, featuring a “Grab-and-Go” wall lined with salads and bowls, as well as a dine-in option for the guests that want to hang out and enjoy the quirky signage and dozens of succulents. We had the chance to try a few of their signature menu items as well as grab a "bonut" or thirteen. I wasn’t starving when we made the trek over to Batch 13 so I opted for the “It’s All Greek To Me” lunch bowl. The hummus and vegetables were light and delicious, a perfect refresher for a warm summer afternoon. Not exactly filling for those who want a complete lunch, but could definitely serve as a sharing item for a table. 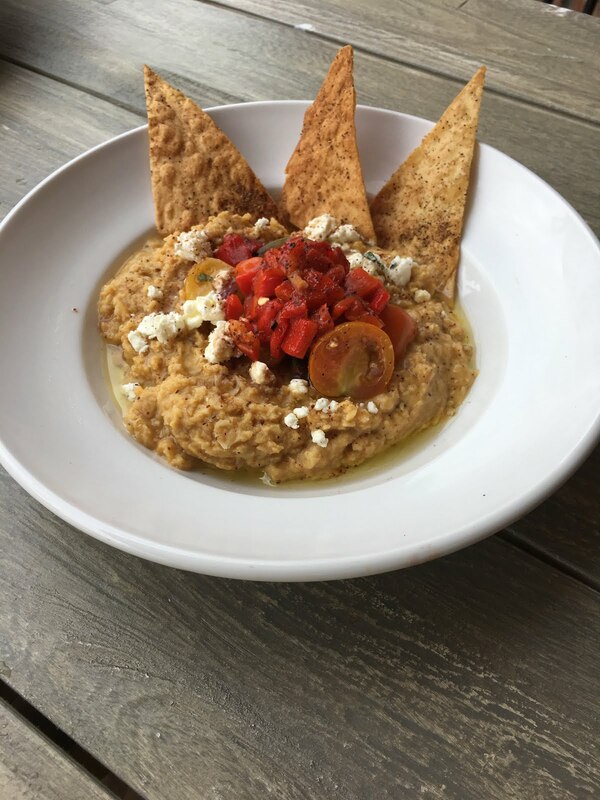 Herbed hummus, cucumber, feta, mixed tomatoes, olives, roasted peppers, extra virgin olive oil, balsamic reduction sauce and sumac, with lavish chips. The “Wild Wild (South)West Hot Bowl” was my personal favorite. A rice bowl, served with spicy chunks of chicken, veggies and pickled jalapeños...right up my alley. Spicy chicken cutlets, pickled cabbage, charred corn, pickled onions, roasted red peppers, pickled jalapeños, black beans, cilantro, warm seasoned rice and Southwest Ranch. 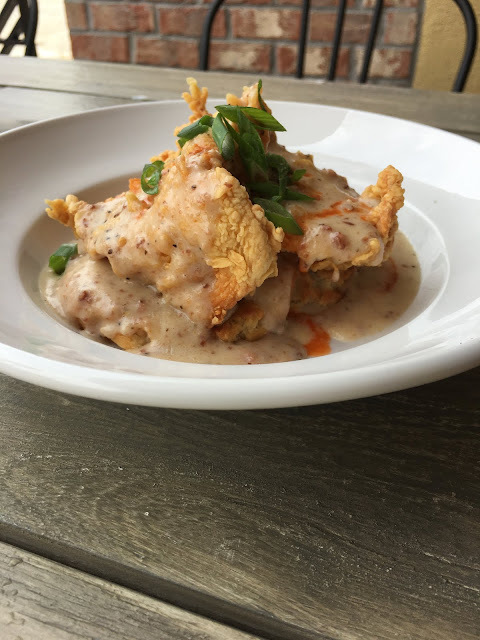 The table favorite was definitely the "Spicy Fried Chicken and Andouille Gravy Smothered Biscuit." This classic spoke to the hearts of all of the Popeye’s lovers out there. Fried chicken and a warm buttermilk biscuit, what else could a South Louisianan need? Andouille sausage gravy, fried marinate chicken and Copeland's hot sauce on a toasted buttermilk biscuit. To cap off the meal we tried a handful of Chef Darryl Smith’s signature creation, the “bonuts.” This fusion of a donut and biscuit is something that could get my wallet in trouble if I lived closer to Batch 13. I recommend the apple cinnamon bonut. It's like a gooey apple pie that is meant to be eaten for breakfast. Glorious. 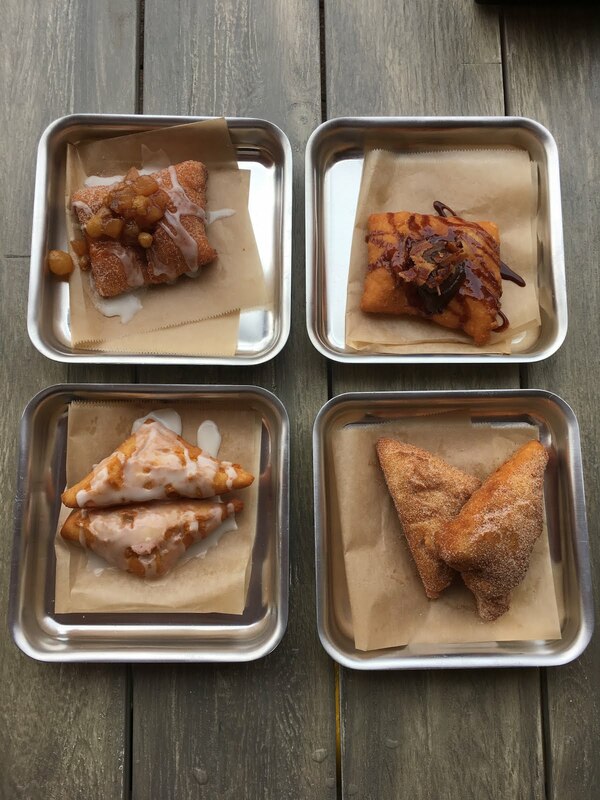 From top left going clockwise: Apple Cinnamon, Hot, Choc & Bacon, Cinnamon Sugar and Glazed bonuts. 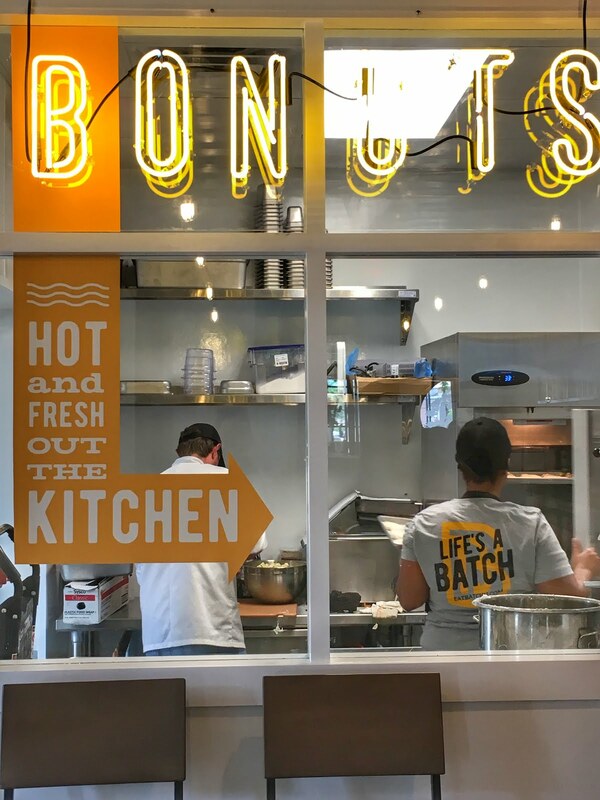 Batch 13 Biscuit & Bowls is a must lunch spot for those of you who frequent the Essen/Perkins area. It's quick, convenient and darn good! A great fast-casual breakfast and lunch addition for that part of town.